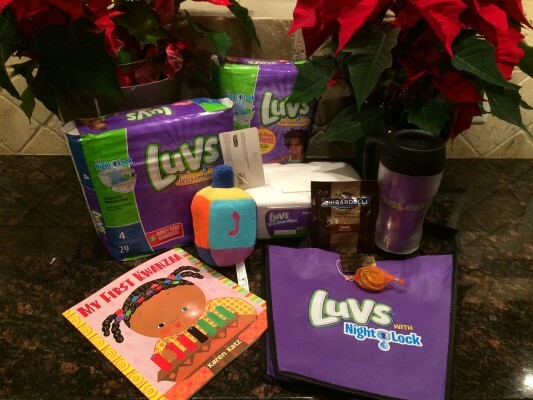 Luvs Leak Free Holiday & Giveaway! I’m sure everyone is deep into preparations for the holidays. I am finally getting some Christmas shopping done, we have a few more family Christmas traditions we need to squeeze in, I am nailing down schedules for which grandparents will be around what days, and I am already planning our big family Christmas dinner. Phew…this time of year is so fun, but it is also so exhausting! We will be in the car and driving a lot in the next two weeks. One thing I don’t want to worry about when we are traveling around visiting our favorite Christmas spots is diaper leaks. Luvs diapers is a trusted name in baby care, and knows that the holiday season is full of stressful moments. Luvs doesn’t want diaper leaks be one of them. This holiday, Luvs wants everyone to celebrate a Leak-Free Holiday. 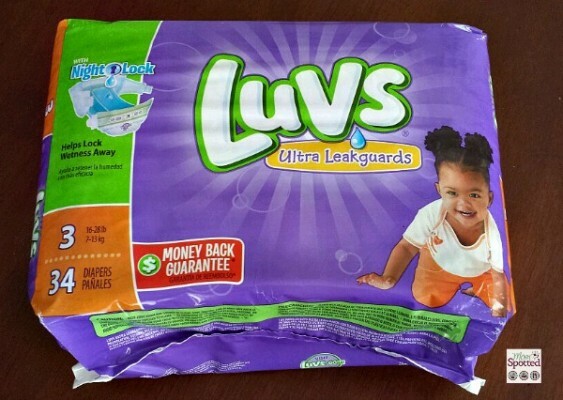 Luvs with NightLock offers its largest absorbency area EVER to help lock wetness away, which means less leaks during the holiday season for baby and more time for parents to enjoy the festivities. As we are out shopping, running errands, and all the other holiday fun I love knowing Luvs diapers keep Halli dry both day and night. I need her to have the best sleep she can so she can be happy and ready to go for the day. Luvs keep her leak-free through the night which helps make a merrier morning. Not much is worse than going to get Halli out of the car to realize she has some kind of mystery moisture all over her. Then I realize her diaper has leaked, and I pray I have an extra outfit. Which the extra outfit I carry is never as cute as her original outfit. LuvsLeak barrier leg gathers ensure leaks are kept away from holiday outfits and in her diaper – where they belong! Have you checked out Luvs adorable “Will It Leak” video series yet? Well, tis’ the season of holiday miracles! And this year, Luvs is turning clicks into free diapers. From December 9th – 25th, for every view their Will It Leak “Santa Suit” video receives on their social media channels, Luvs will give a diaper to a child in need through the Children’s Miracle Network. The holiday fun doesn’t stop there! This holiday, Luvs is also inviting parents to whip up a baby book for their child in a few quick clicks with Luvs and Tweekaboo. Get yours here. Right now one (1) Mom Spotted readers has the opportunity to win ONE (1) Luvs Prize Pack!! Contest ends 12.18.14 at 11:59pm. For Official Giveaway Rules click here. U.S. Residents Only. My favorite holiday tradition are making homemade decorations with my kids for the Christmas Tree; and let them help decorate Christmas cookies for the family!! I love making Christmas cookies. I love baking at Christmas time we make cookies, butter brickle bread, spiced pecans, toffee, and coconut cake. We also go look at Christmas lights and go to Christmas Eve services together as a family! We love to put the Christmas tree together while listening to Christmas music. I love baking Christmas cookies with my boys with Bing Crosby playing in the background. I love the entire process of picking out a tree and decorating it with my husband and kids! My favorite is putting up the Christmas tree on thanksgiving night! The Christmas tree with my kids !! We watch A Christmas Story on Christmas night before bed in our pjs with hot chocolate! We love to attend our candelight christmas eve service, look at christmas lights and just spend quality time together as a family! Thanks for the opportunity! We go see the city lights on Christmas Eve. I also enjoying baking Christmas goodies with my children. My favorite tradition is having my family over for dinner on Christmas Eve. Making Christmas cookies with the whole family! We love to decorate the tree while listening to christmas music and drink hot chocolate. We make Christmas cookies together — the whole family! Baking sugar cookies and leaving them out for santa! I love making sugar cookies, butter brickle bread, coconut cake, spiced pecans, and toffee! Every year my daughter, daughter in law & best friend decorate my rolled out sugar cookies. We have the best time. I love letting the kids make ornaments each year! Reading Twas the Night Before Christmas before going to bed! My favorite tradition is decorating the tree and then watching a Christmas movie with cocoa and cookies.;. Going to the tree farm to buy the “perfect” tree and then decorating it with new & old sentimental ornaments while listening to Christmas music is my favorite Christmas tradition. We love to make a Birthday cake for Jesus! We love baking cookies for neighbors. I love every year all the family comes here. We love baking for friends and family. My favorite holiday tradition is driving around neighborhoods and checking out all the decorations. Doing advent activities with my kids. I enjoy baking and decorating cookies with my grand kids. I love baking cookies with my mom and sister. my favorite holiday tradition is going to see the Christmas lights with the family. I love making Christmas cookies!! My favorite tradition is the kids putting out cookies and milk for Santa before they go to bed on Christmas Eve and a carrot for Rudolph. I love when the kids help decorate the tree.